A Way of Life Out West. In 1941, young Les Davis from Philadelphia was a college senior taking premed classes at Dartmouth. On Jan. 16th of that year he penned a carefully worded letter to Ed Springer, who managed the CS Ranch at Cimarron, N.M.
"Dear Uncle Ed - This is my last year at Dartmouth College and in looking to the future I have, for quite some time, considered the possibility of going West. An active life, that is, an occupation which involves active physical endeavor, has always appealed to me." Davis and his family celebrated his 81st birthday on October 24th, 2000. But he remembered that time as if it were only yesterday. "I wasn't winning any medals for scholarship and I thought about this ranch that my mother's father, Frank Springer, had started," he said. "The essence of my letter was, 'what about me coming out there and trying to learn the horse and cattle business?'" Uncle Ed answered by return mail, "Come on out." By the time those letters were exchanged, the CS was already 68 years old. 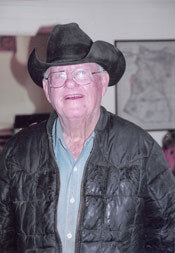 The CS Ranch was founded in 1873 by Frank Springer. It is situated at the foot of the Sangre de Cristo mountain range in northern New Mexico with headquarters near Cimarron. 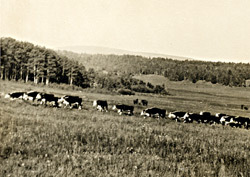 The ranch encompasses 130,000 acres of the 1.7 million acre Maxwell Land Grant. Frank, with his brother Charles, whose initials are used for the ranch name and historic brand, built a ranching enterprise that endures to this day. Les Davis, grandson of Frank Springer, took over management of the CS in 1947. He and Linda Mitchell married in 1953. Linda brought her own ranching heritage to the CS. 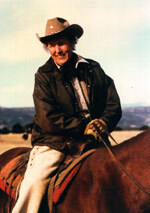 Her father, Albert Mitchell, ran the family ranch at Albert, New Mexico and managed the famous Bell Ranch from 1933 - 1947. Today the CS Cattle Company remains a family business. Warren M. Davis manages the Crow Creek division. 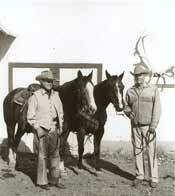 Randolph S. Davis handles the elk, mule deer and antelope hunting and the Headquarters cattle. J. Kirk Davis, since the passing of his father, Les, in 2001 is now president of the corporation and runs the ranch farming operation, along with maintaining the ranch infrastructure. 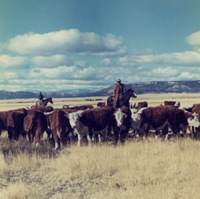 Bruce P. Davis manages the mountain country, the Clayton Place cattle and does the livestock marketing for the ranch. 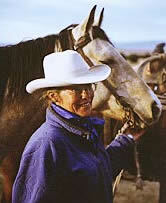 Julia Davis Stafford handles the ranch's strategic planning and legal matters..
Linda and Les Davis dedicated their lives to their family, the CS and the livestock industry. Their success was recognized in 2000 when both were inducted into the Hall of Great Westerners at the National Cowboy and Western Heritage Museum in Oklahoma City. Les passed away May 12th, 2001. Linda remains active in ranch operations, as an EMT with the Cimarron Volunteer Ambulance Service and continues with their shared commitments to state and national efforts that foster western heritage. The CS horse-breeding program began in 1885, tracing its origins to a visionary but ill-fated horse program played out in the early 1880's near Cimarron. Frank Sherwin, then president of the Maxwell Land Grant Company, believing the climate of northern New Mexico to be ideal for thoroughbred horses, purchased 20 of the finest English mares available. The mares were acquired at a cost of $1,000 each. Uhlan, a French-bred stallion of flawless pedigree was purchased for $15,000. The mares and stallion made the long and difficult trip to New Mexico. Regrettably, the enterprise failed, Sherwin was fired and the horses sold at a Sheriff's auction in 1885. Frank Springer purchased two stallions and a dozen fillies at the sale. This well-bred band of horses formed the nucleus of the CS Ranch horse program and produced many foundation horses of the American Quarter Horse breed. Over the years, horses have played a major role on this cattle ranch. 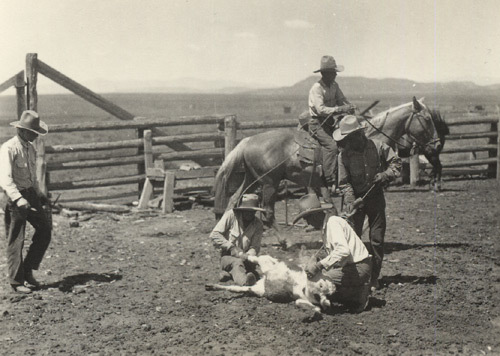 During the 1920's the CS Ranch was a supplier to the U.S. Army's Western Remount Service. The Army furnished the CS several thoroughbred stallions to cross on their proven mares to produce topnotch mounts for the cavalry. 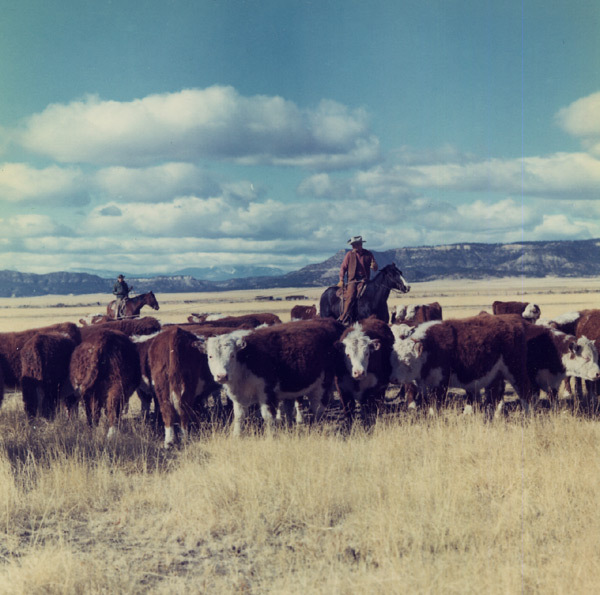 When the depression tightened its grip on the ranch, causing plummeting cattle prices, the CS horses, a band of 200 high quality mares and numerous quarter horse and thoroughbred stallions came to the forefront as a profit center for the ranch. The CS produced premium all-around ranch horses, cavalry mounts, hunter-jumpers and polo ponies, setting a new and higher standard in the western United States. The CS has been a part of thoroughbred racing in New Mexico since the late 1930's. Les' uncle, Ed Springer, known as "The Father of Racing in New Mexico" played a pivotal role in the legislative approval of pari-mutuel waging. CS thoroughbreds have won 10 New Mexico-bred futurities, the New Mexico-bred Derby and the State Fair Handicap several times. Many high goal polo players across the country such as Tommy Hitchcock, Tommy Rupert, Lewis Stoddard and Will Rogers favored CS polo ponies. Will Rogers found that the CS Ranch raised and trained cow ponies had all the agility, stamina, and level-headedness that was needed to make first-rate polo ponies. The great demand for CS polo ponies resulted in a rivalry between cowboys and polo proponents on the ranch for the best mounts. Jiggs Porter joined the CS in 1933 and was the long time cow foreman on the ranch with 63 years of service. Jiggs deserves the credit for training the six Davis children as stockmen and women and for the continual improvement of the cattle and horses on the CS. Jiggs' priorities and persuasiveness are well illustrated by a story from the 1930's. Jiggs had started a horse named Bootlegger. The horse's potential as a polo pony was noted by Ed Springer, who told young Porter to bring the horse to headquarters for sale with the other polo pony prospects. When the day arrived, no Bootlegger. Jiggs reported to Springer that the colt pulled up lame and was not sound to ride. To this, Springer squarely addressed Porter and said, "If he means that much to you, I guess you can just ride him for a while longer!" 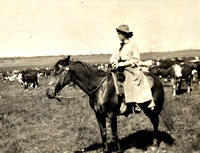 The CS polo pony program passed with the onset of World War II when the ranch again focused its attention on cattle production in support of the war effort. After World War II, the face of horse breeding and agriculture in the United States changed forever. Mechanization was the order of the day. The CS horse-breeding program refocused on support of the cattle operation. This remains the case today, with a broodmare band producing top ranch horses and replacement fillies. 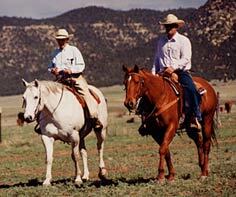 The quality of the operation was recognized in 2000 when the CS was awarded the AQHA Remuda Award.